I grab the bag of popcorn from Ian, intent on salvaging what little hasn’t reached his mouth yet. He protests but only half-chewed kernels sputter out of his mouth, so full is it. Peering into the now grease-stained bag, I see a disparate mix of khaki and orange — the Chicago mix of caramel and cheese ”“ that has more of the former than the latter. “You finished all the cheese!” I accuse Ian, my eyes boring holes into him. “I did not!” he replies defiantly, arms crossing over his weight-room-enhanced chest, oily-orange fingers neon signs of guilt. “Well, what good is it if I don’t have cheese along with the caramel?” I shoot back. And that, as you can see, is the whole idea behind Chicago-style popcorn. Until I meet friends and business partners Oliver Ong and Rory Johnson, co-founders of Chicago Popcorn Shops, I don’t realize that popcorn isn’t just popcorn. Even when I visit the ever-famous Garrett’s Popcorn in Chicago, I didn’t realize the travesty I’d committed in daring to compare it to Poppycock and its mass produced ilk. Now I know better and this popcorn pair has set me straight. I may know it as “caramel” popcorn but to these two Chicagoans, it’s “carmel.” Even the way they say the word, so gently, almost lovingly, is indicative of its importance, and the way this golden substance is cooked carefully to achieve its superlative bronze sheen. Oliver and Rory had to adjust their caramel recipe to work with Manila’s climate and humidity. Despite the challenge, their ebullience is evident coupled with their insistence on popcorn done properly. “Ingredients matter, the process matters,” Oliver says. “This is handcrafted popcorn. We’re literally crafting this by hand,” echoes Rory. The two touch on their mantra of “making it fresh, keeping it local,” their commitment to using great local ingredients as much as possible; already, they’re huge fans of Philippine sugar. Chicago-style or even Chicago popcorn achieves a precarious balance that’s salty-sweet and boasts impeccable texture. It’s caramel that rings true with notes of deep brown sugar and butter, and cheese that’s worlds away from the “splash and shake” variety. Though he refused to reveal much, Oliver confirms that they don’t use cheese powder. 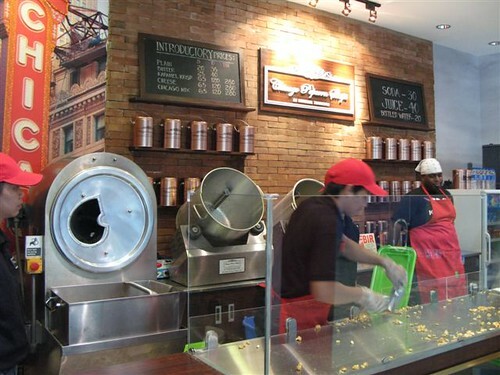 When you visit Chicago Popcorn Shops, choose your desired ratio of salty-sweet (Chicago Mix), or go for the Plain, Butter, Karamel Krisp or Cheese. Prices range from P20-P65 for a Single, P40-P120 for a Double and P280 for a tin, which I highly recommend. 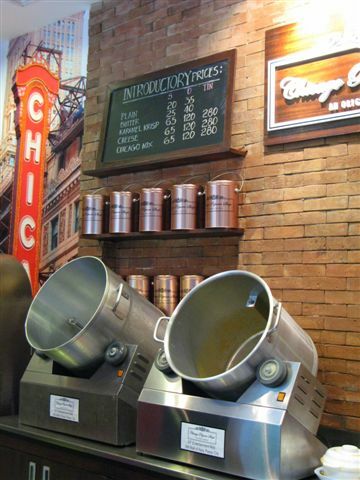 If you bring the tin back on your next visit you can refill it for just P200 (an introductory offer). I promise you that you’ll finish half the tin and you won’t even know it ”“ or want to share. All you’ll be left with are your cheesy-sweet fingers to lick clean. 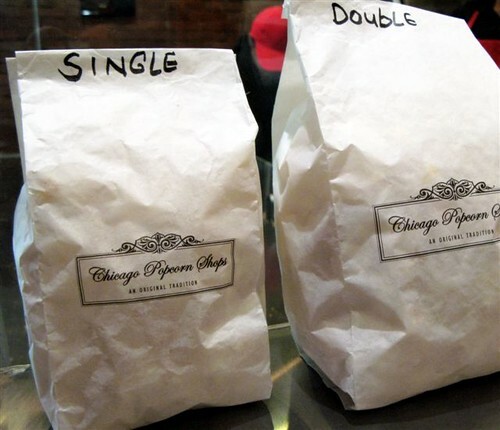 Become a fan of Chicago Popcorn Shops on Facebook. I’m munching from my can right now, hee hee hee hee *crunchCRUNCHcrunchCRUNCH* :9 The insidiousness of this concoction is how with the constant interplay of salty and sweet, it ensures your palate never gets tired of the taste. Coupled with the lightness of the popcorn (the air-popped-ness is a definite plus!) and it’s a perfect candidate for ‘mindless eating’ in front of the TV (or PC, hehehe) and before you know it, you’ve eaten half the can and you could still keep going. Why oh why is this in Mall of Asia?! We were traumatized by our first visit to MOA and have not been back there since. However, this popcorn shop has truly piqued my interest. I love, LOVE cheese popcorn, but only if it’s done right. The cheese popcorn in Greenbelt3 is weak, I prefer the cheese popcorn sold in Rockwell. And “carmel”! Oooh, I drool. This is the kind of product worth going to MOA for and lugging over to Davao for my cousins. MUST. TRY. THESE! i like the tin can. cute! Darn! Darn! Darn! I was just there last night! Ian texted me about this place and I’m going to be in MOA all of this weekend, so CPS is definitely on my list of things to visit. The shop looks like a twin of Garretts!!! Even the scooping area, golly. Garretts mix kept me company on a two of the three days of a cross country train trip last year, my fingers were glowing orange as a testament to all my munching. shucks! i bought a double chicago mix that’s more of the “carmel” but i regretted it ‘coz the Cheese popcorn was so delicious! It was out of this world.. unlike the splash and shake cheese popcorn out there…. 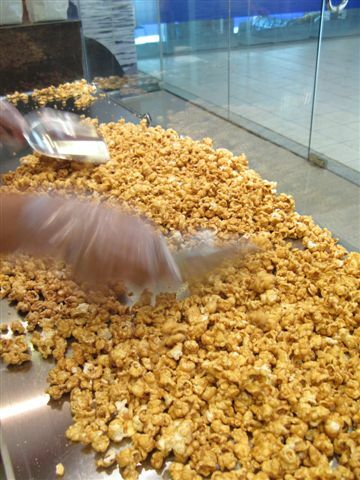 so when you head to Chicago Popcorn Shops, ask for more cheese in your mix! Next time I will..Rory and Oliver were very nice and accommodating.. they give out samples too! OMGosh…I can’t breathe. Another reason for me to walk from La Salle to MOA. haha…Eye lurv popcorn. how many grans is a single bag? how about the double? any idea? ooooohhh! i can’t wait to try this! must remember next time i’m in moa. thanks for the post. oh i hope i hope i hope they expand to the north. MOA is just waaaaaaaaaaay to far for us Quezon City folk! Aisa, i hear yah! I had to brave Osmena,Quirino, and Roxas Blvd. traffic to get to MOA from QC! It was worth it though!!! My advice: Go for more cheese! I would so LOVE to try this popcorn! I’ll bet it is wonderful, the kind you can hardly keep from eating all of in just one sitting! Wow! Popcorn heaven! It’s good to know that there’s now Chicago/Garrett’s style popcorn here in the Philippines. Every time I’m in Chicago, I never fail to buy Garrett’s…there really is something about their popcorn…it sort of, melts in your mouth. Will definitely check out this shop! Thanks Lori! I love Chicago Style Popcorn!!!! Nothing more satisfying than looking at faintly orange fingertips after diving into a tin of the Chicago mix (little more cheddar). As a popcorn gourmand, they really do make their product fresh. I’ll concede the cheese is better than the powder flavoring variety. The “carmel,” sorry, after all the gushing, it just doesn’t come up to snuff. You can buy a bag of a popular chichirya brand of caramel popcorn and get the same quality for much less. Maybe it’s the popcorn, it simply doesn’t melt in your mouth. And freshness, well, I bought my first can on a Wednesday afternoon, so maybe that’s why there was no detectable difference re: freshness. Maybe I’ll try again on a weekend, and also check out the “carmelizing” and cooling. The best I can recall is when Holy Kettle K0rn first opened here: huge, fluffy, melt-in-your-mouth popcorn, no scratch-your-throat kernel hulls, minimal unpopped kernels if any, which sadly, they don’t have any more. When I told them I first heard of them from dessertcomesfirst, they did say that a lot of their customers referenced dcf. My kids like eating from the tin, though. Just tried the Chicago Mix today. The caramel’s good but the cheese lacks flavor (seems ordinary). I prefer the cheese flavors from Chef Tony’s. When I ate the Chicago Mix, my sweet salty fix wasn’t satisfied (I’d still go to Chef Tony’s for that). PS I’ve tried Garrett’s popcorn in Chicago and I loved it! i just tried chicago mix last night. and i can say im so disappointed. it didn’t meet what i am expecting. the cheese popcorn is not every crunchy. it lacks cheese. the caramel is too sweet. i will never buy another popcorn from there. such a waste of money. too bad there shop is so nice looking. i was planning to buy this on Sunday and drive all the way to MOA but the last three comments got to me. Is it really so disappointing?? so what happened their quality deteriorated that fast? Mina, I live in Pasay, I could walk to MOA. “Carmel?” Discounting the affectations of the furiously marketing founders, not worth the price. Cheese? Okay, granted, different, possibly better. I want Cheetos-style outrageously cheesy. No, that’s not right, as long as I”m wishing, I want 1970’s (not the crap that came later) Carol-Ann’s Cheese Potato Chips-style really-truly-madly cheesy. Fresh? I should have realized the truth the moment I saw the 2-foot storage bins. I went on a Wednesday afternoon, maybe the quality will be better on a weekend. Guess you’ll have to find out for your self. Taste is subjective, follow your tastebuds, never what other people have to say about it. Amen to that Lori 🙂 you never know when another “Chef Tony Lover” (or whatever other brand of popcorn, not singling him out!) -type troll is just out to spread some anti-buzz on a new player. Hey! Just like Garrett’s. Do they also have the caramel-macadamia popcorn? I must compare when I go home. I can’t wait to get hold of some of your tins, they look soooo yummy! im so disappointed with chicago’s popcorn. i like chef tony better. crunchier, and has more flavor. i wasted my time and effort just to buy the popcorn, really a waste.. packaging is also not presentable. iba ba to sa garrett popcorn.? > Dec 1, 2011 Who’s The #1 Fan of DCF? These People Are! Sep 19, 2011 M.I.Y.O. Monday: What Is Your Bubble Milk Tea of Choice?